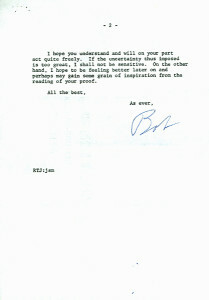 Typewritten Letter Signed, Bob, one and one-half pages, quarto, July 19, 1966. On his personal stationery to Pat Ward-Thomas, Esq. in England. “I acknowledge yours of 14 July. Believe me, there is nothing I dislike more than failing to accept enthusiastically any assignment you might give me; now, however, I simply must make some reservations. “My health has been especially troublesome lately and I have been sorely pressed with personal matters, especially in putting together some odds and ends for a book on golf technique I am publishing in October. 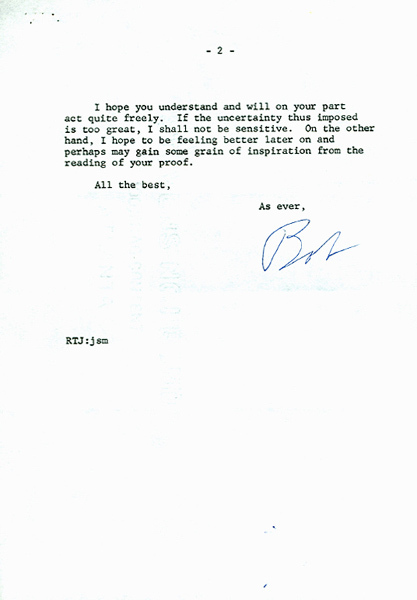 “I am not one of those fortunate persons who can sit down before a typewriter and spill out words that make sense. The act of creation on a blank page costs me no end of pain. You speak so lightly of a piece of a thousand to twelve hundred words. For me, it would be just as easy to write five or six thousand; it is making the start that hurts. “I honestly see no way I can do what you ask straight out of a clear, blue sky. If you might be able to accept the reservation that I shall try once I have seen your proof, then I shall be happy to have a go at it.